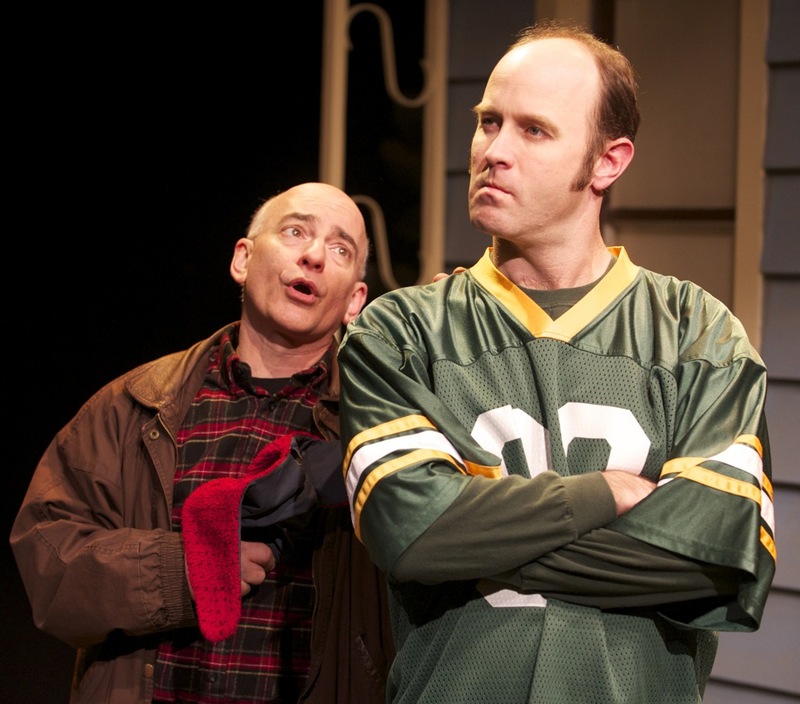 Milwaukee Rep production boasts strong lead actors and powerful scenic elements. 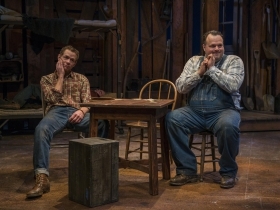 Milwaukee Repertory Theater presents Of Mice and Men in the Quadracci Powerhouse from January 19 to February 21, 2016. Left to right: Scott Greer and Chiké Johnson. Photo by Michael Brosilow. How daring was John Steinbeck in 1937! The emerging author – soon to be a giant of modern literature — contemplated a novella-play in which vernacular poetry and moment-by-moment dialogue would convey as one seamless piece the aspirations of the American dream in the era of the Great Depression. Here, pinned for eternity, are the lonely men wandering farm to farm, recycling in their minds a longing for their own future patch of independence despite being broken down by brutal work and animalistic hunger. Using the brighter George’s adherence to the childlike hulking Lennie and his dream of stroking rabbits, Of Mice and Men brilliantly conveyed that desire for companionship and spiritual rescue – and created a belief in Americana that lingers to this day. It is so insightful a play that it needs to be taken out every few years and re-examined as an enduring encapsulation of man’s brightest and darkest sides. 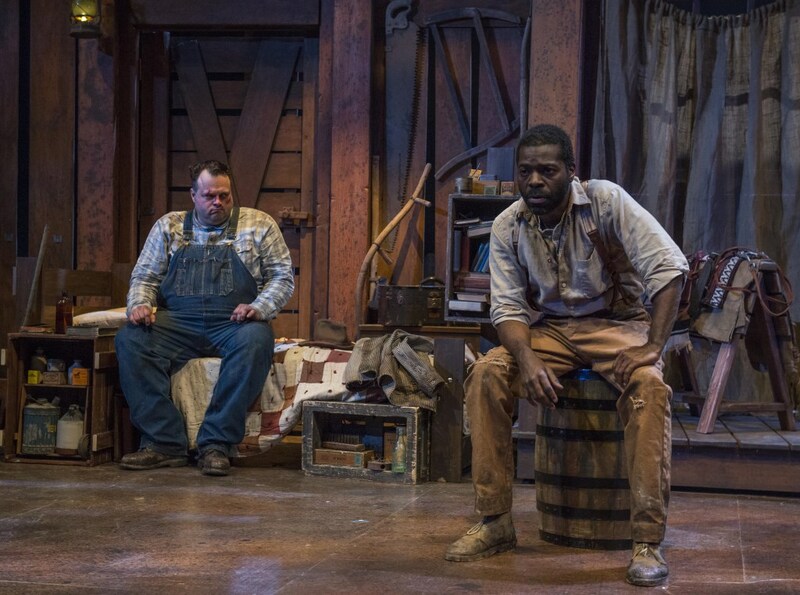 Visually this Milwaukee Repertory Theater production touches on the larger landscape of open America before cramping us into the work farm where the illusions are shattered. People shoot dogs when they grow old – but not people, do they? They don’t kill simple wishes – do they? Steinbeck hoped one way and warned of another. 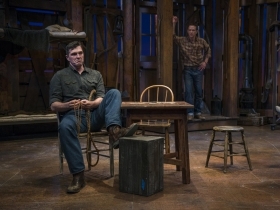 Rep artistic director Mark Clements first fashioned Of Mice and Men nine years ago into a award-winning piece of Philadelphia theater, now resurrected at the Rep in co-production with the Arizona Theatre Company (yes, aside from production money I’m not sure what that means either). It occupies the Quadracci Powerhouse through February 21 and brings back Scott Greer, the Lennie who drew huzzahs in Clements’ Philly foray, here surrounded by familiar Rep stalwarts and some potent new additions. With familiarity and some freshness, with a constant thrust toward functionality in storytelling that seeks to drive the central elements of the play without meandering too far up some interesting side roads (and honor Steinbeck for planting those character seeds even if the production doesn’t stray far from the basic George and Lennie relationship) this is a production immensely powerful in key moments and never less than competent. 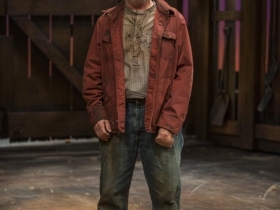 Its look is special — intelligently fashioned in how scenic designer Todd Edward Ivins carries us from bog to bunkhouse to barn magnified by Joe Cerqua’s original music as sets constrict our original vista. The music, the quiet lighting of Jesse Klug and Rachel Laritz’s down-home costuming echo a 1930s twang and palette yet contemporize the drama. The central actors are as faithful to the rhythm of the times as the production elements. Jonathan Wainwright’s George is a wonderfully exact and winning presence: always moving forward yet subconsciously bitter, always knowing his dreams are failing, never calling undue attention to the underlying meaning, just glancing off every tone with humor and humanity. His George might be criticized for not dwelling on every critical link, but that’s right because George is also a victim — suddenly forced by feelings into the role fate has doomed him to from the start. It is a performance of confidence and maturity. Greer has combined the country-bumpkin mannerisms of such 1930s movie actors as Grady Sutton with the innocent enthusiasm and bulk panic that drives the story to tragedy – twisting his fingers nervously and stricken by his own inability at self-control. What would be repetitive in lesser hands turns every bug-eyed impulse to speak and constricted gesture into extensions of an always childlike hope. As the surly black man isolated by race into lone quarters, Chike Johnson catches a needed note of cynicism while James Farrugio’s Slim is so matter-of-fact friendly that the audience may miss how much skill is put into that presence. As Curley, the bantam aggressive son of the boss, Bernard Balbot does not go beyond the outlines the plot requires, which makes his presence more a gimmick of convenience than the rounded troublemaker Steinbeck’s people constantly talk about — and we keep waiting to see. Surprisingly the same problem of emerging from the shadows of plot convenience affects veteran Jonathan Gillard Daly, who never provides the establishment strength the audience should expect from the bossman. In this flotsam of humanity rejected because of age and attitudes, an often neglected part is Candy, and here James Pickering’s professionalism is constantly on display, never missing a worried reaction or sense of hope. However, such skill of tone seldom roots out the rounded humanity and audience empathy this aging farmhand should deliver. 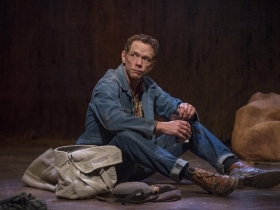 Sean Patrick Fawcett, prowling the stage in exasperation, exactly captures the farmhand without feelings, so important a balance to the plotline. 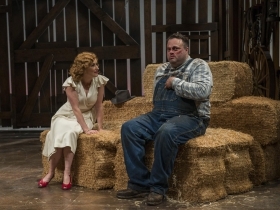 The biggest disappointment is in a role that Steinbeck tries to magnify in the second act — Curley’s flirty, doomed wife. The dialogue constantly suggests a balance between a tart and loneliness and naiveté that Kelley Faulkner stabs at rather than finds, reducing her to a patsy element rather than elevating the tragedy that Steinbeck intended. All this leaves what many would want first and foremost — George and Lennie — as the dramatic center of the piece. They are good enough that many will find their conversational and emotional rapport more than sufficient, but Steinbeck is in fact constantly driving us toward a larger empathy with the human condition.